Posted on Saturday, July 21, 2012, by Eric - TV Geek Army "Revered Leader"
Yeah, I said it: Workaholics is one of the great comedies on the air these days. It's a thought that has been floating around my mind for some time now, but a string of absolutely off-the-charts hysterical episodes – the latest being the instant classic "Real Time," in which the fellows must prevent their boss, Alice, from hearing a slew of drunken voicemail messages that they left on her office phone – confirms it. But I realized that even while the plotting and "storytelling" of Workaholics has become gradually more sophisticated over its three seasons, and the writing is often quite sharp – especially as delivered through the cocky/dumbass personas of stars Blake Anderson, Adam DeVine, and Anders Holm (all of whom are co-creators and writers on the show) – it's the delivery itself that puts the series at a different level. This clip does a pretty good job of showcasing why Workaholics works. A simple set-up, again from "Fat Cuz" – the boys want boss Alice to give them the "extra" handicapped parking spot at the office – allows for a good bit of riffing and silliness. There's also very frequent use of unusual but clever language ("scratch our butts," "change tampon, grody") that Comedy Central will at times throw on the bottom third of the screen as a Twitter hashtag (example: #bearcoat). I also recognized recently that there is not an enormous amount of character differentiation between its three stars – Adam is the king of Frat House schmuck tomfoolery, Ders is a peg more buttoned down and ambitious than his buddies, and Blake, even with his wild hair and dude 'stache, is the more earnest and good natured of the group. In a sense, that allows "us" – and likely that means the Comedy Central target rich audience of18 to thirty-something – to inject ourselves into the show and feel as though we are hanging out on the roof, drinking beer, and riffing on endless pop culture asides and rants about friends and co-workers along with the boys. Speaking of pop culture, the careful observer of Workaholics will pick up laser sharp references dropped into the verbal slipstream on a pretty regular basis. An example comes from several episodes back when, in emphasizing a point he felt he was right on in making, Ders raised both hands in the air, and deadpanned, "O'Ders rules." This will resonate only if you are quick enough to pick up a minor but recurring gag ("O'Doyle rules!") from the 1996 Adam Sandler movie, Billy Madison. So I suppose I am the perfect target demo for Workaholics, if a bit on the older side, as I spent many a slacker-iffic afternoon in my just post-collegiate life watching that very same film. Anderson and DeVine were guests on The Adam Carolla Show podcast recently, and I was very interested to learn that Workaholics began as a web series and was eventually noticed and picked up by Comedy Central. The boys claim that it took them several weeks to read their e-mail and figure out that Comedy Central was interested – I'm not sure if I believe that part or if the story was presented that way simply to further establish their slacker mystique! In any event, I found it inspiring that writers and performers as clearly talented as these guys are found a path to success by way of putting their work on the web. 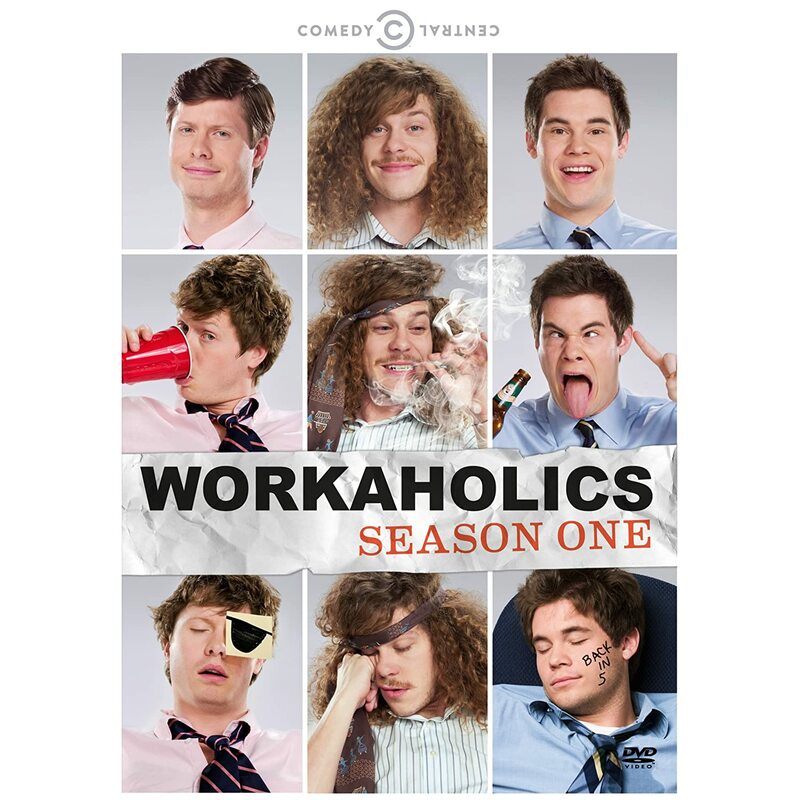 Workaholics airs Tuesday nights at 10:30 p.m.
After a few so-so episodes (not bad just kinda bleh) it was great to see another hilarious episode...definitely the best episode of the season for sure, and the pacing of this one was perfect from the get-go. Also loved that they used "I'm All Fucked On Beer" by Admiral Radley when Adam was downing tons of beer, that song is great and obviously a good fit for this episode. I totally agree with you! Workaholics is so funny! I wish those three guys were my desk mates at my office at Dish! I didn’t know that they took part in creating the show too; that’s awesome! I don’t think the series gets enough credit for how hilarious it really is. I think a lot of people just don’t know about it. I didn’t even watch it until I randomly decided to record it one day. I have the Hopper DVR that comes with so much recording space that I don’t even know what to do with it all, so I’ll record a bunch of things on a whim. It worked out for me this time around! If liking this show is wrong, then I don’t want to be right!